Listen live to BBC Radio Nottingham. That's it for updates from this dedicated live page for the fire at Nottingham railway station. The East Midlands Live page will resume at 8:00 on Monday, in the meantime, the story on the fire, which is now being treated as arson, will continue to be updated. It's been an eventful day for emergency services in Nottingham - let me just remind you of what happened. At about 06:30 the fire service received a 999 call to a fire in the women's toilets at the railway station. The building was evacuated while Queen's Road, Carrington Street and Station Street were all closed. About 50 firefighters were at the scene of the blaze where flames spread "very quickly" into the station roof making it "complex" to put out. Experienced firefighters described it as one of the most difficult blazes they had tackled in about 20 years. In the afternoon the transport minister Jo Johnson MP visited the station to see the damage and commend the emergency services for their work. British Transport Police then announced it was treating the blaze as "arson" suspecting it was started deliberately. Just after 17:30 the fire service announced the fire had been fully extinguished however crews would remain at the station overnight. It is still unclear if the station will reopen on Saturday or not. The roads look no worse in Nottingham than on any normal Friday evening, other than around the railway station. In the last few minutes, Queen's Road has reopened and traffic is expected to return to normal very shortly. 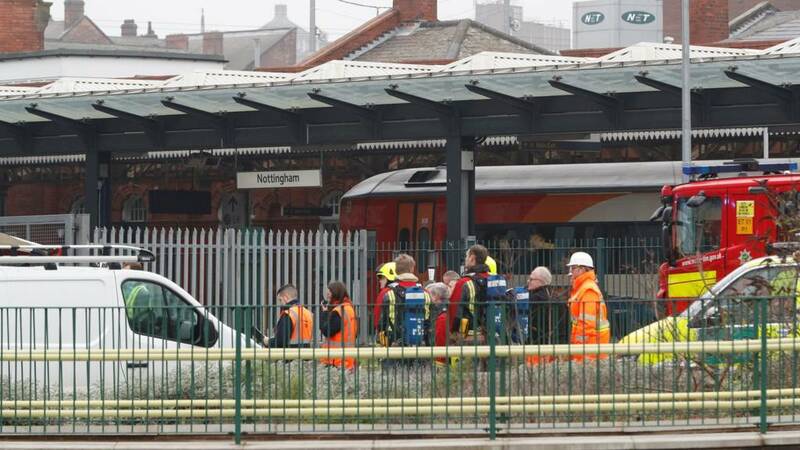 East Midlands Trains has said it is still unsure when Nottingham railway station will be able to reopen. In its latest update, the firm said: "Structural engineers will need to assess the station before we can understand which trains will be able to run tomorrow." It says its tickets can be used on a variety of alternative routes. Fire crews faced "arduous" conditions, but the blaze is now under control. 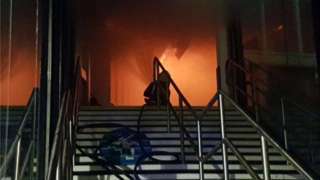 Video caption: The blaze broke out in Nottingham railway station at about 6:30 GMT.The blaze broke out in Nottingham railway station at about 6:30 GMT. Those planning to use a train in Nottingham tomorrow are being advised not to by British Transport Police. The message has gone out to football fans in particular with both Nottingham Forest and Notts County having fixtures. The message comes following a fire that's kept the city's railway station closed all day today. The force said: "The station is unlikely to be open by tomorrow, and if it does open, there will not be a full service operating. Therefore we are asking people to make alternative travel arrangements." If you're driving home in Nottingham this evening you might just want to be aware that Queen's Road eastbound is still closed because of the fire at the railway station. At the moment there is queueing traffic between Carrington Street / Arkwright Street and London Road. The Labour MP for Gedling has praised the emergency service response to the fire. There's been widespread disruption across the rail network after a fire at Nottingham Railway Station. East Midlands Trains have admitted it's been an "amazingly disruptive day" for passengers after all routes in the region have been disrupted. For James Wright, who was visiting Tattershall Castle in Lincolnshire today, that's meant a confusing journey back to his city home city of Nottingham. He says he was offered "no alternative and no help" after his journey was cancelled. East Midlands Trains say they've offered bus replacement services between Newark and Lincoln and have had "good communication" with passengers. East Midlands Trains has said cancellations today have caused "huge disruption" across the region. Kirsty Derry told the BBC she remains optimistic that some railway services may be able to return to Nottingham tomorrow but advises customers to have a backup plan just in case they're not. Talking about the damage caused to the building Ms Derry said it was "heartbreaking". She said: "We had a fantastic refurbishment investment here, opened in 2014, a gorgeous station. "Thank God the historic part of the station we believe is safe." British Transport Police is treating the huge fire at Nottingham railway station as arson. It's thought the blaze, which started in the women's toilets, was started deliberately. Enquiries have been ongoing today and we now have reason to believe the fire may have been started deliberately. Officers are working to identify anyone who may have been involved in the incident, and we are appealing for information from members of the public. Fortunately, we have not had any reports of injuries as a result of the fire." The fire service released a number of their fire engines from Nottingham railway station however it said work is still ongoing to fully extinguish the fire. At its worst there were about 60 firefighters at the scene. Football fans - CrossCountry has said they may not be operating trains in and out of Nottingham tomorrow following a fire at the station. The transport minister has said the damage caused by the fire at Nottingham railway station is "substantial". Jo Johnson said he was confident the station would be back up and running in "a few days". Video caption: The transport minister said the fire has caused 'substantial' damage to the station.The transport minister said the fire has caused 'substantial' damage to the station. A government minister has commended the emergency services' response to the fire at Nottingham railway station. Jo Johnson, the transport minister, told the BBC their work has been "extraordinary". He's just posted this on Twitter. The main entrance to Nottingham railway station had a major refurbishment in 2014 costing £50m. The revamp saw the restoration of the century-old frontage as well as the creation of extra shops and parking. Trams have now started to pass over Nottingham railway station however they're not stopping there. Here you can see some of the damage caused by the fire which started this morning. Video caption: Trams have now started to pass over Nottingham railway station but they're not stopping.Trams have now started to pass over Nottingham railway station but they're not stopping. If you're leaving work soon and wondering how you're going to get home with the trains not running, this might come as good news. CrossCountry trains is putting on direct buses between Nottingham and Derby.